I thought a little history of home recording might be in order at this point. When Books On Tape first asked me to record from home, I constructed a crude booth in the basement and managed to acquire a reel-to-reel tape machine. I hired an actor friend to engineer the recordings. We would dub the reels to cassettes for duplication purposes, then ship the whole mess to California. I think it was Blackstone who came up with a cassette machine that actually worked well for home recording. It was three-head Akai with a switchable tape/monitor function. (Blackstone had contacted me around 1990 about recording for them, but they didn't want to annoy Books On Tape, so I used yet another name, Tom Parker, for their recordings. Again, no one was fooled but it kept the peace.) This little Akai deck was quite handy. If you made a mistake, you could rewind a skosh, press play, punch in at the appropriate spot with the record button, then deftly tap the tape/monitor button to hear yourself as you recorded without an annoying delay. Naturally, this made shipping and dubbing much easier. They could duplicate right off the master cassettes. It was a very good machine--in fact, just recently someone was digitizing some of these old cassette masters at Blackstone and remarked on how good they sounded! I was always looking into new technologies, and throughout the 80's and 90's I spent a lot of time at the local pro audio shops investigating and testing new gadgets that would make the work easier and more efficient. In the late 80's the first DAT (digital audio tape) machines appeared. The advantages were many, including no print-through (the process by which a magnetic signal will imprint itself across several layers of tape wound on a spool) and the cassettes were even smaller than audio cassettes, which made shipping a breeze. But the disadvantages were frustrating. You couldn't "punch in" on the run with a DAT machine. You had to stop the tape, locate an approximate spot, then hit record and hope you had the right place. I can always tell an old DAT recording by the slight random pauses here and there. These were punch-ins that didn't quite time out right. Also, if you over-modulated on a DAT (in other words, got too loud) the signal fell apart and you got digital garbage for a second or two. Analogue tape, by contrast, had a very high tolerance for recording at too high a level. There was some distortion but nothing that the average listener would notice. So you had to watch your recording levels very closely to make sure you didn't exceed the tolerance of the DAT tape. The other problem with DAT was that the recording heads, which spun very fast like a VCR recording head, were tiny and would easily get out of alignment. A tape that played on one DAT might produce a lot of digital glitches on another DAT. To this day Blackstone keeps several different machines on hand to remaster their old DAT tapes, in the hope that they'll play back without errors on one of those machines. Sony made a very fancy DAT machine that allowed for punch-ins, but they were very expensive and you still had to account for the lag between the playback head and the recording head when you punched in. Flo Gibson used these successfully for many years, but few home narrators could afford them. They cost about $3000. A basic Sony or Tascam DAT machine cost about $1200. Then in the early 90's, Alesis developed the ADAT machine. This was a huge step forward. It recorded eight parallel digital tracks on a Super VHS tape. It worked just like a reel-to-reel recorder, in that you could rewind, play and punch-in on the run effortlessly, and the timing was always spot on. The little remote control was silent and easy to use in the booth. I think I was the first one to use this machine, and it took me a while to convince Books On Tape and Blackstone to convert, but within a short time they did and the ADAT became standard for many narrators for a number of years. Alesis used an excellent digital-to-analogue conversion chip, resulting in an unusually warm, pleasing sound. You could fit eight 45 minutes cassette sides on one tape. You'll still see some recording studios that keep their old ADATs in running condition, for back-ups or other purposes. It was a dandy machine. Then in the late 90's, Digidesign came out with the first affordable computer-based recording system, the DIGI 001. This consisted of a sound card you installed in the computer and an eight-channel interface for audio input. The package included a scaled-down version of ProTools, still the best and most popular digital recording software on the market. Again, I think I was one of the first to adopt this for home audiobook recording, but I can't say for sure. It wasn't easy--the publishers didn't know what to do with raw digital files, so I would dub eight tracks off the computer onto an ADAT and send those out. But it wasn't long before computer work stations became the standard. Nowadays you can put together a professional digital recording system for under $2000, and that includes everything from the microphone to the computer itself. It's hard to imagine what a break-through non-destructive, hard-drive recording was. You could cut, paste, re-edit the length of a side, record a correction and paste it into place, compress, expand, de-ess--all with a touch of a button. You didn't have to do these processes in real time, it only took a couple of seconds. It has transformed home recording, as we all know. Someone tweeted a question yesterday about why older recordings would be deemed unusable. As I mentioned in passing above, reel-to-reel and cassette tapes work by imprinting a magnetic signal into a strip of tape coated with a magnetically sensitive oxide solution. The magnetic force from the recording head rearranges the particles in the oxide coating in such a way as to imprint a sound signal on the tape. The problem is that reels and cassettes are wound one layer upon another. When stored this way for many years, the magnetic imprint from one layer of tape will bleed through to the layer next to it, creating a faint "ghost" or echo of the sound from the adjacent layer of tape. If you listen to an older audiobook, sometimes you will hear this echo in the pauses between sentences. It's distracting. In some cases it can be silenced or edited out, but this is a laborious process and often destroys the natural sound of the recording. (Blackstone actually has a proprietary process that enables them to remaster these recordings quickly in a manner that eliminates most of this print-through effect.) In addition, the oxide coating on old tapes tends to dry out and flake off, leaving "drop-outs" or slight gaps in the original recording. Thus, older performances are often deemed irretrievable. Okay, great, but what about today's book? As a tie-in to my own "obsession" about home recording gadgetry, I nominate Noble Obsession by Charles Slack. 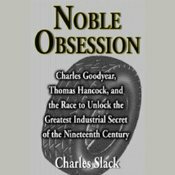 It is, as the subtitle so aptly states, the story of "Charles Goodyear, Thomas Hancock and the Race to Unlock the Greatest Industrial Secret of the 19th Century." That would be, of course, the vulcanization of rubber. It's a corking good story of science and American inventiveness, and extremely well-written. It's remained another one of my favorites over the years and is currently available on Audible. I am enjoying reading your posts this month. This column about mastering onto cassette tapes brought back a lot of memories for me of recording on the AKAI three-head decks back in the 90's. I was working for Books In Motion as studio manager/narrator/dulicator/editor/author relations and got so good at recording on those decks I could stop, recue and begin almost as fast as I can now with a computer keyboard. BIM has digitized many of those old recordings and, you're right, the quality of some of them is remarkable. Unfortunately, BIM insists on applying NR to them which causes that awful warbling effect (something they still do to their new recordings). I think they would be much better with a little studio hiss on them than that distracting phasing/warbling sound. Anyway, thanks for the memories. Really enjoying the columns.